If you’re BlackBerry mobile phone user and you like to capture the screen of your BlackBerry mobile phone, you should check out the application called Screen Muncher. It is FREE application available for download in BlackBerry App World. Screen Muncher can capture every screen of BlackBerry except home screen. 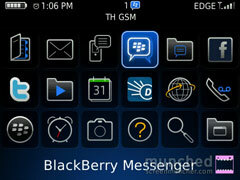 After you installed, just press BlackBerry Icon key and choose Munch Screen. It will instantly capture the Screen and will ask you “Email” or “Save” in your device or “Option” menu where you can activate into Pro account. The only problem is that there is a Munched water mark in right bottom corner in every captured images in FREE version.